Here are just a few things you can do in a butcher shop these days: Get married; have a launch party for the cookbook Pure Vegan. (It sounds like an SNL skit featuring Stefon a.k.a. Bill Hader sharing details with Seth Meyers about a new club, but it actually happened at L.A.’s Lindy & Grundy.) And drink lots of lager in an adjoining German-style beer garden. These are the coolest butcher shops in the country right now. Star chef Paul Kahan’s butcher shop is also a market, a sandwich shop and a 32-seat restaurant. There’s a daily-changing menu of sammies like the Return of the Gyro—braised pork belly and chile vinaigrette on griddled flatbread; and charcuterie, too. (The rotating Butcher’s Meal currently consists of cocido: smoked chorizo, braised beef, blood sausage, chickpeas, potatoes and cabbage; it’s $22 and serves two.) The meat counter features gorgeous steaks, dry-aged duck and smoked ham chops. For those who find this ambiance romantic, Quality Meats is a place for “unique and intimate wedding receptions,” not to mention intensely carnivore bachelor/bachelorette parties. If you’re not getting married but want to party at PQM, there are Burger Battles every Tuesday night throughout October. After operating super-popular hot dog carts around D.C., Red Apron is opening three brick-and-mortar locations this year. (One is a deli and restaurant at Union Market; another is a huge butcher/market/restaurant in Fairfax, Virginia; and one is slated to open later this fall in D.C.’s Penn Quarter, with a restaurant called Parts & Labor attached.) 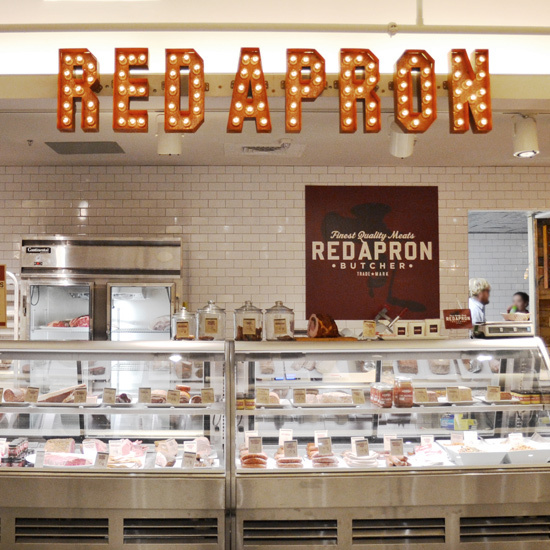 Red Apron specializes in locally sourced, humanely raised, whole-animal butchery and small-batch handmade charcuterie. Chef Nathan Anda’s line of 80 products includes original creations like espresso-rubbed lomo, or pork loin. He also makes items like "Porkstrami," meatball and muffuletta sandwiches, as well as hot dogs like the Frank White, topped with pulled pork, coleslaw and pork rinds. Meanwhile, the Joey Bagadonuts is a provolone-stuffed Italian sausage dog with chile aioli and hot pickled pepper relish. New Yorkers are high maintenance (I speak from experience) - and diet obsessives. And so, Dickson’s, in Chelsea Market, offers Paleo Subscriptions of humanely raised ground beef or ground pork. (It's cheaper if you buy more: A one-time pick-up is $6 per pound; a weekly pick-up for 12 weeks is $5 per pound). The meat is ground the night before, plus you get 10% off any other meat while you’re subscribing. Everything is produced in-house from whole animals purchased from New York state farms. Because New Yorkers also freak out about their pets’ diets, Dickson’s makes dog food from the same meats they sell at the market, mixed with yams, apples and carrots. Not only do Amelia “Lindy” Posada and Erika “Grundy” Nakamura host vegan book parties at their fab neighborhood butcher shop, they also have butchering classes that range from the five-week "Going Whole Hog" to a Thanksgiving Turkey Demo. (Come the big day, you’ll be able to “carve your turkey like a butcher.”) They’ll also deliver orders, including specials like scrapple, something you won't find all over L.A. Most importantly for a butcher shop, they also sell meats, from conventional cuts of organic, sustainable pork, beef and lamb to kalbi (Asian beef short ribs). Meat doesn’t travel far to get to this cool butchery that buys carcasses only from ranches and farms that are within 150 miles of Berkeley. In addition to custom cuts, the Local Butcher Shop makes sausages (like beef chorizo, sage breakfast links and BN Ranch beef hot dogs), pâtés, sauces and a rotating sandwich of the day. They also offer classes, running the gamut from sausage- and stock-making to goat butchery and braising. Owner Aaron Rocchino previously cooked at Chez Panisse; all the butchers are trained chefs.